I step to the top of my mat. My guru, Alison, says “it’s time to go in.” I take a breath: in, out. I am calm, focused and quiet in my head. The room is warm, inviting. I am surrounded by community and friends at The Light Within Yoga Studio, in West Grove, Pennsylvania. No where to go, no lists to attack. In, out. In, out. These are the moments that I am free from anxiety. This safe space is wonderful. I am a strong woman. I can do this. I show up, fully. But… what about the other 23 hours of the day? What about the crippling anxiety that can suddenly attack me: in my car, on a plane, in the grocery store, at a dinner party? Back on my mat, we are in upavistha konasana. I work myself slowly into the pose. “What is the purpose of this asana?” Alison asks, then answers her own question: “the purpose of the asana is to breathe.” Yes, breathe, I remind myself. My eyes fill with tears. How many times in my most difficult moments have I been saved by breath? In, out. Thousands of times. My mantra. My saving grace. My practice has never been the same since Alison spoke these words: the purpose of the asana is to breathe. Yes: this, I realize, is what I need during the other 23 hours of the day when I am not always in that warm, safe environment. My husband, an E-RYT 200 yoga teacher (who taught me ashtanga yoga and continues to be my teacher) is also a photographer, so we travel extensively for his work. With scheduling, planning, packing, traveling, being in new environments, etc. my anxiety has a hay-day: if left unchecked. So many opportunities, my anxiety jumps for joy! Over the years, I have learned to take the breathing pill more frequently. Stress? Breathe. On a plane? Breathe. Missing home? Breathe. Since my anxiety stems from misguided and out of control thoughts, another mantra I use frequently is: I will let the thoughts flow through me, like the breeze. In, out. The events that happen around you only have power over you, if you let them. These days, the anxiety struggle is real. Yogic philosophy offers many tools to help along the way, like a mantra. In The Mantram Handbook, Eknath Easwaran tells the story of a parade that is going through a town, and a rouge elephant who’s trunk is out of control, grabbing bundles of bananas and wrecking carts and vendor stands along the way. Once the elephant is given a stick to hold in its trunk (a mantra) the animal is able to walk with the parade without the devastating destruction of its wandering trunk. The stick (a mantra) can quickly quiet down an out of control mind. One of the best and easiest mantras to remember is: in (on the inhale), out (on the exhale). In, out. In, out. Another tool I have used is an adult coloring book. During a few incredibly difficult months last year, the coloring book literally saved me… from myself. Small things can help as well, like limiting sensory input, minimizing screen time and spending time outdoors. One paradox that I have discovered during our travels is that I find there are large spans of time where I really do not have anything to do: since we are away, I don’t have to clean, run errands, work on the computer, etc. and to my dismay, these open moments can be an invitation to chaos in my head. Cue the breath: in, out. In, out. Thankfully, using the tools I have mentioned, I gradually bring myself back to earth, to what ever is in front of me, to each present moment. Christine Yurick is an editor, poet and yogini. There is nothing like sitting back and watching a really crazy movie. Before I became a yoga teacher, I studied TV and movies. I studied screenwriting at Emerson College, where I was exposed to all kinds of film and television. The professors asked us not only to watch, but to analyze, discuss, and write at length about these narratives. There was an entire class about Buffy the Vampire Slayer, “Buffy Studies.” It sounds silly, but pop culture reveals so much about class, gender, race, and ethics in society. Though I did not ultimately pursue a screenwriting career in LA, I maintained a passion for stories and how they are told. I still watch movies with a critical eye. Every movie, even the “bad” ones, teach me something about human nature. The characters, the actors and directors who bring them to life, and the viewer all play a role in the experience. The movie can provoke fear, excitement, anger, hope, or just boredom. It is not so different that the way many students absorb a yoga class sequence and the teacher who delivers it. One movie really got me thinking recently: Ingrid Goes West. The story hit me hard like a colorful, recklessly driven bus. Aubrey Plaza (a DE native!) stars as the titular character who travels west to LA in order to find (re: stalk) and basically con an Instagram star, Taylor Sloane (Elizabeth Olsen). Ingrid’s motive does not seem to be anything more sinister than befriending Taylor and being part of her shiny, social media-posted world. Still, Ingrid is unstable and her voracious need for inclusion makes you wince. The two start to become close until Taylor’s sociopathic brother Nicky comes to visit. It is not long before he attempts to sabotage Ingrid’s plan. Taylor, though sandwiched between two very troubled people, is not exactly the innocent victim. The sunny, chic, clean-eating flower child persona she projects on Instagram does not tell the whole truth. The rapid fire of glossy posts, perky hashtags in this film, along with the slow burn of nervous breakdowns and narcissism is enough to make your head spin. We could blame it all on those dang millennials with their upspeak, ironic sweaters, and their avocado toast (guilty as charged on all accounts), but every generation has known discontentment. People of all ages are also now capable of using and abusing social media. I am unsure about the role of yoga within social media or vice versa. I do not think it is strictly a good or bad thing. I do think it is a thing we should be mindfully observing as teachers and students. Take Instagram—there are so many inspiring, beautiful photos of people doing asana. Jessamyn Stanley is a positive example of yoga inspiration. She embraces her body and shows people that you do not have to be a sinewy white woman to rock a strong practice. She admits that she only started posting those pictures to track her alignment, but it became an inclusive movement. On the other hand, can a person truly practice while projecting an image? Is the person doing headstand by a waterfall aiming to inspire us, or are they “humble bragging”? Also, those rocks look slippery. Do they have health insurance? I feel a mixture of awe and concern. Maybe the issue is not with the person posting these daring acts of nature yoga, but with those who scold it as superficial. You could turn it around and simply call them jealous. As a yoga teacher and practioner who has posted a pose or two, I see both sides. I have to say that I truly admire—often “LIKE”—a strong headstand on a beach. Assuming their cervical spine is healthy—how cool! 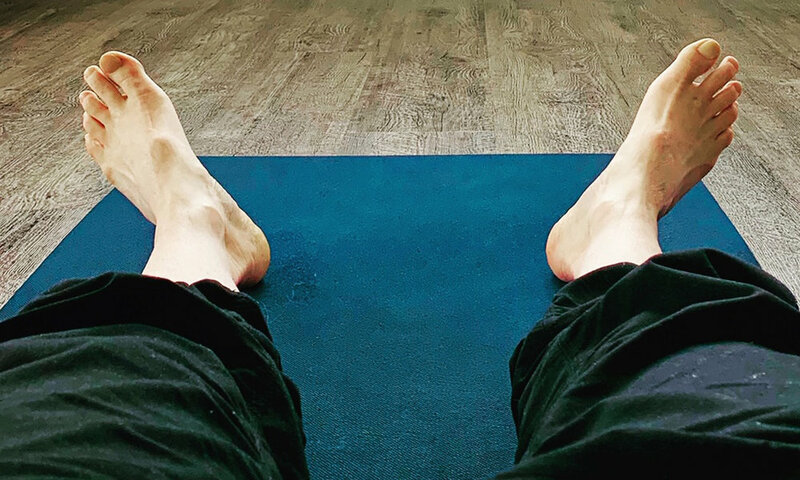 It makes me happy to see the simple yoga posts too—like someone folding with ease in a wide angle forward fold, even if I miss out on that experience in my own practice. Why should I begrudge them? Really though, it does not matter if I am content or not with their practice. The key, I believe, is contentment with my own yoga journey, camera-ready or not. For me, yoga is now about connecting people so they can create community. That’s really hard to do online and through social media. I kind of hope everything spins back around and drops off the Internet—that people loop back into the practice of student-teacher relationships and being in the room with other people. Social media still has a place—for example the #metoo movement. I just wish more teachers, especially younger teachers in the online space, would think of social media as a way to help the world, instead of just as a way to become a big name. There is so much work to be done. There is caution, but also hope in Brathen’s message. Social media is the way many people find out about a local yoga studio or teacher. Informative articles about yoga anatomy or philosophy can be shared as well. These posts of pictures and articles are not yoga, but they may spark a light in someone to try the actual practice. Once someone decides to walk in a studio or work with a teacher, the community that Brathen mentions can actually be built. Social media aside, what’s the real cause of FOMO? It will always happen in a class, too. So many of us have rubbernecked around and thought, Why can’t I look like ___? His/ her ___ is so perfect. The difference in an actual class is that we are seeing another person, not just their image on a screen. We have the opportunity to connect with that person face to face. If we talk to this person we idolize or envy, we might learn that they are human like us. Maybe that is the thing that disturbed me most about Ingrid Goes West—the failure to connect in an honest way. I’m going to note feelings of FOMO in my own practice. Where do they come up? What triggers it? How can I be more content with the body, mind, and emotions that I have right then? If we try this, it could make for an interesting journey instead of a train wreck.